Bhogi is the first day of Pongal celebration in Tamil Nadu and the first day of Sankranti celebration in Andhra Pradesh. One of the most important events on the day is the burning of dirt and rubbish accumulated over a period of time. Earlier the event was limited to farm waste but nowadays people burn plastic, rubber, tyres and non-degradable material causing environmental pollution. Thanks to the campaigns conducted by State governments and NGOs, there is awareness among public regarding the pollution caused by tyres and plastics. There are also court orders against burning of plastics and tyres and the Environment Protection Act, 1986, Section 15, specifies penal action for persons who cause air pollution. In spite of all these efforts, there are people who still burn plastic and tyres. The Bhogi bonfires increase particulate matter in air and cause several diseases. There is also a low visibility level on Bhogi day due to the smog. Burning tyres emit dangerous gases like oxides of nitrogen and sulphur dioxide. Hydrogen cyanide gas and vinyl chloride are emitted due to the burning of plastic and PVC. 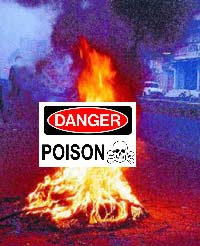 Inhaling of these gases can cause cancer, respiratory problems, asthma, water eyes, itching and trigger other diseases. This Pongal and Sankranti spread the message of environmental friendly celebration. What to do on Bhogi Pongal?